The clash between evolution and creationism is one of the most hotly contested topics in education today. This book, written by one of America's most distinguished science educators, provides essential background information on this difficult and important controversy. Giving a sweeping and balanced historical look at both schools of thought, John A. Moore shows that faith can exist alongside science, that both are essential to human happiness and fulfillment, but that we must support the teaching of science and the scientific method in our nation's schools. This highly informative book will be an invaluable aid for parents, teachers, and lawmakers, as well as for anyone who wants a better understanding of this debate. From Genesis to Genetics shows us why we must free both science and religion to do the good work for which each is uniquely qualified. Using accessible language, Moore describes in depth these two schools of thought. He begins with an analysis of the Genesis story, examines other ancient creation myths, and provides a nuanced discussion of the history of biblical interpretation. 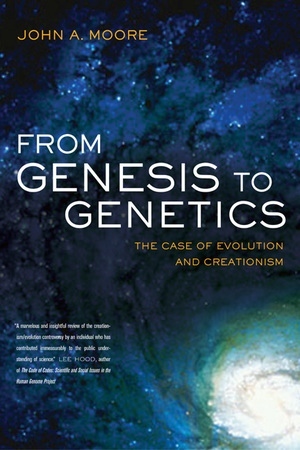 After looking at the tenets and historical context of creationism, he presents the history of evolutionary thought, explaining how it was developed, what it means, and why it is such a powerful theory. Moore goes on to discuss the relationship of nineteenth-century religion to Darwinism, examine the historic Scopes trial, and take us up to the current controversy over what to teach in schools. Most important, this book also explores options for avoiding confrontations over this issue in the future. Thoughtfully and powerfully advocating that the teaching of science be kept separate from the teaching of religion, Moore asks us to recognize that a vigorous and effective scientific community is essential to our nation's health, to our leadership role in the world, and to the preservation of a healthy environment. John A. Moore (1916-1992) was Professor of Biology at the University of California, Riverside. He is author of Science as a Way of Knowing: The Foundations of Modern Biology (1993), Biological Science: An Inquiry into Life (third edition, 1973), and Heredity and Development (second edition, 1972).